Following the recent Typhoon Haiyan disaster in the Philippines, Projects Abroad has successfully initiated the Disaster Relief Project. With eight volunteers currently in destination and a further ten arriving over the coming month, the renovation of one classroom at Don Pedro Elementary School was completed on Friday 13th December 2013. The volunteers helped in putting up a new ceiling, installing glass window blades and painting the classroom walls. On Tuesday 17th December the new classroom was officially handed over. The renovations of Don Pedro Elementary were fully funded by Projects Abroad. The Disaster Relief Project is now working on the renovations of DCM Taytayan Integrated School, where the roof and ceiling of two classrooms were completely destroyed and some classrooms sustained minor damage. 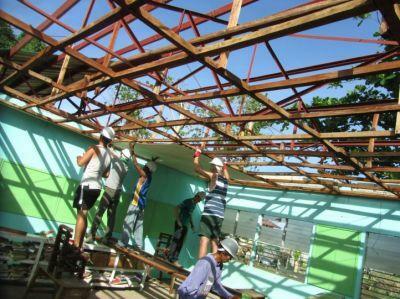 Last week, our volunteers and local builders completed putting up a new ceiling for both classrooms. It is estimated that the two classrooms will be completed before Christmas. Projects Abroad has also funded the reconstruction of this school. The Disaster Relief Project is also working on the renovations of a further three schools in the area. 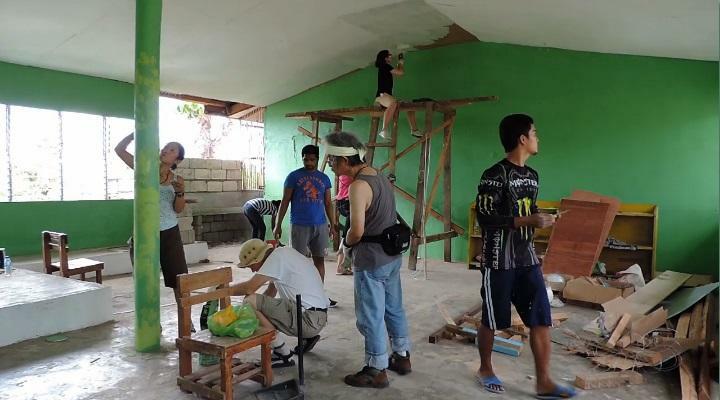 Both current and future volunteers arriving in December and January will work on the reconstruction of Bung-aw Elementary School where, after the typhoon, only two classrooms survived. The aim is to complete the construction of two new classrooms and to build new roofs and ceilings for two other classrooms; with a hand-over date in mid-January. Read more about the Disaster Relief project .